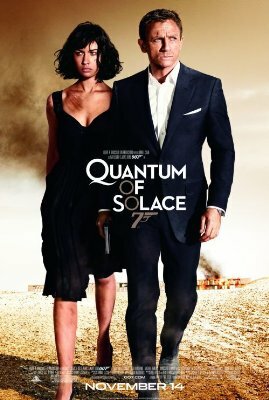 Just back from watching the new Bond film Quantum of Solace at the new Odeon in Liverpool 1. I’ll talk about the cinema tomorrow for tonight I’ll foist my opinion of the film on the rest of the world. The pre credit sequence opens up fast and hard in media res and is very effective at setting up the film. After that the action scenes and plot twists come fast for the next one hundred odd minutes. Like 2006’s Casino Royale this is a leaner paired back Bond with no vanishing cars or other silly gadgets. There were some funny lines delivered completely straight and there were a few nods to the earlier films. As a building engineering graduate I’d like a word with the designer of the fuel cells in the hotel. I can’t think of a good reason for placing them throughout the building other than as an excuse for a lot of explosions. The locations are great and the use of a London flat is a nice contrast to the more exotic. As with Casino Roayle there’s no repeat of the bad CGI of Die Another Day. The supporting cast are excellent, the sound track effective and the film is technically well put together. This is a harder, colder, tougher Bond than Casino Royale. Where Casino Royale gave us a chance to see inside Bond this film gave us fewer windows into his state of mind. That’s a shame because part of what made Casino Royale so effective for me was that it humanised Bond which in turn made him more believable and more vulnerable. Bond being vulnerable makes the action more interesting because (even though we know he won’t die) it feels more like he might. While I wouldn’t expect them to try and incorporate the short story the title comes from into the film including a little more reflection would have been as nice a homage as the sniper sequence is in The Living Daylights. Overall a good Bond movie and a good film.